It kind of flew under the radar, but Facebook recently added a timeline option that may be of use to a few of you. 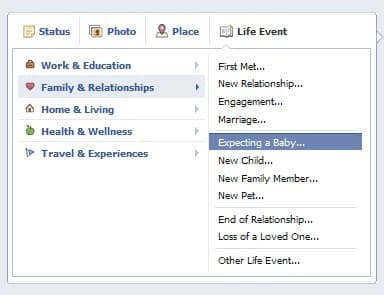 Now, expecting parents can tell the (Facebook) world all at once that they are expecting a little bundle of joy by adding "Expecting a Baby" to their timeline life events. 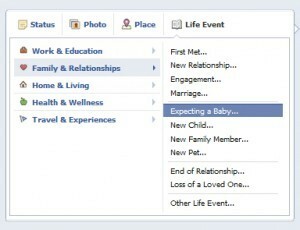 Goto your Facebook timeline and in the status update area, click on "Life Event"
Click on "Family & Relationships" and then on "Expecting a Baby"
Your new life event will then appear on your timeline and your announcement will show up in the notification section of your Facebook friends' News Feed just above where the birthday announcements appear. Marketers, this new feature gives you yet another demographic to target through Facebook ads. Retailers that offer baby registries, daycare centers, diaper and formula companies, pickle and peanut butter makers, etc all can now segment a group of Facebook users that is dealing with a unique situation now and also planning for a lifestyle change in a few months. Very useful.